It's a busy time at the Centre now that Spring has finally arrived and many of our avian charges are hatching new families as we speak. During the past fortnight a trio of European Eagle Owls has joined the fold as well as a young Lanner Falcon chick. 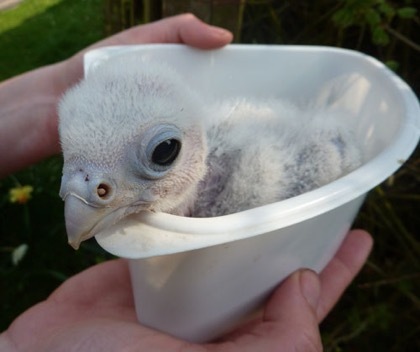 Together with the Great Horned owlets that arrived a short while ago, the one thing these peculiar-looking youngsters all have in common at the earliest stages of their lives is their likely inability to win any beauty competitions. However regular followers and lovers of all things raptor will know that it's not long before the 'ugly ducklings' turn into extraordinarily beautiful creatures. 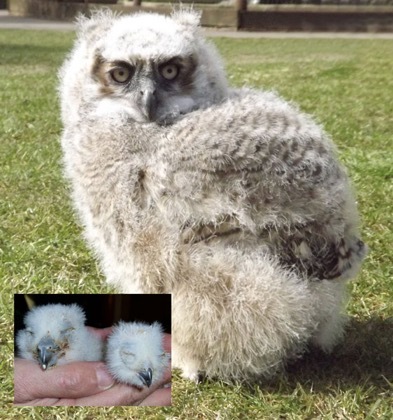 The example pictured below is Birkett, one of the two Great Horned youngsters which in the space of just a few weeks of hatching as a tiny mite is almost unrecognisable as he sports copious downy plumage and stand nearly 18" tall. 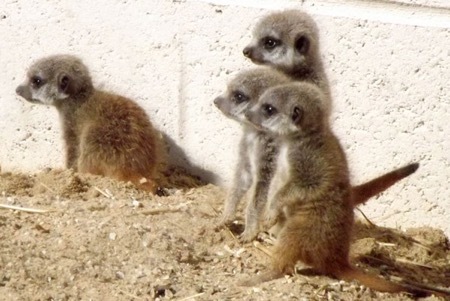 You may also know that last year we started the makings of a colony of meerkats to the Centre to add to the range of small animals which illustrate the diversity of wildlife habitat & lifestyle to our younger visitors. Although not a British species, we felt that their popularity and demonstrable style of 'family living' would add something to the experience of visiting the Sanctuary and so it is proving. Our meerkats too have appeared full of the joys of spring and just around Easter produced a quartet of youngsters which have rapidly integrated with the group of four - mum, dad and two siblings. Already out and about, the antics of the newcomers as they attempt to discover every nook & cranny of their sandy enclosure is keeping everyone amused!